On 25th November, what would have been Andrew Carnegie’s 183rd Birthday, at The Dunfermline Carnegie Library and Galleries in the beautiful Canmore Room, we had a fantastic launch of events taking place in 2019 to mark the centenary of Andrew Carnegie’s death. The event was hosted by Heather Stuart, CEO of Fife Cultural Trust, and included a fascinating talk on Andrew and Louise Carnegie by Carnegie expert, Sharron McColl. Gavin Grant also gave an introduction to the famous Carnegie portrait which is returning to the library after the refurbishment. Joe Whiteman, the great great great grandson of Andrew Carnegie, who appears in our musical as Carnegie, and some of our cast performed a selection of songs from ‘Carnegie – The Star Spangled Scotchman’. We’re looking forward to performing the musical in concert next year at the Carnegie Hall in Dunfermline for 2 nights on May 17th and May 18th. You can BUY TICKETS here. The event is called ‘Carnegie at Carnegie’. A new song called ‘Mothers and Sons’ recently added to the show, was unveiled in the launch event and sung by Donna Hazelton and the women of the cast. 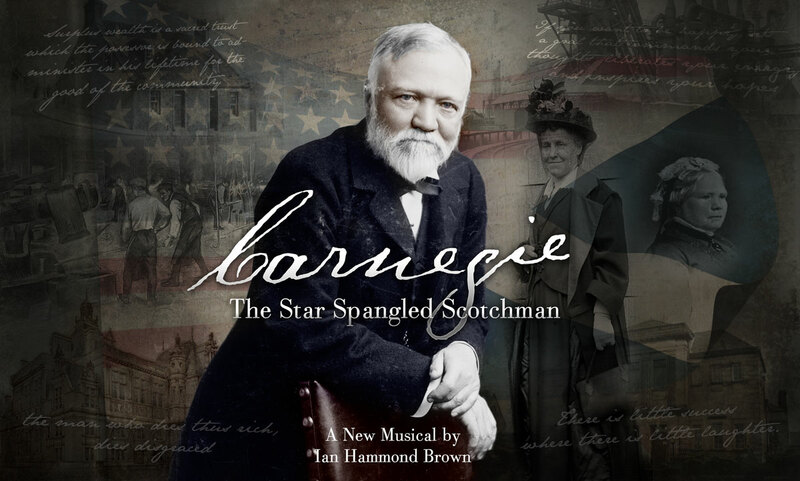 Carnegie – The Star Spangled Scotchman tells the story of Carnegie’s life from the viewpoint of a steelworker killed in the controversial homestead steel plant dispute of 1892 who has come back from the afterlife to decide on Carnegie’s eternal fate in the last two hours of his life. The Dunfermline Press, The Evening Express, The National, The Times, The Daily Mail, The Courier, ITV as well as many others. Andrew Carnegie’s great-great-great grandson Joe Whiteman (centre) and Ian Hammond Brown (second right), writer of Carnegie the Star Spangled Scotchman, join some of the cast in performing songs from the show at the launch at the Dunfermline Carnegie Library & Galleries. Ian Hammond Brown, writer of Carnegie the Star Spangled Scotchman, talks about the show at the launch at the Dunfermline Carnegie Library & Galleries with the Carnegie portrait behind him. Lorna Brown as his soon-to-be wife Louise, sings to Joe Whiteman as Andrew Carnegie at the launch of Carnegie the Star Spangled Scotchman at the Dunfermline Carnegie Library & Galleries. Andrew Carnegie’s great-great-great grandson Joe Whiteman sings as Andrew Carnegie to Lorna Brown playing the great man’s soon-to-be wife Louise at the launch of Carnegie the Star Spangled Scotchman at the Dunfermline Carnegie Library & Galleries. Andrew Carnegie’s great-great-great grandson Joe Whiteman (centre) sings one of the songs from Carnegie the Star Spangled Scotchman at the launch at the Dunfermline Carnegie Library & Galleries. Musicality winner and West End star of Chicago, Donna Hazelton, sings the show’s new song, Mothers And Sons, as Andrew Carnegie’s mother at the launch of Carnegie the Star Spangled Scotchman at the Dunfermline Carnegie Library & Galleries. Heather Stuart, Chief Executive of Fife Cultural Trust, comperes the launch event.